Katherine Tegen Books, 9780062278142, 288pp. 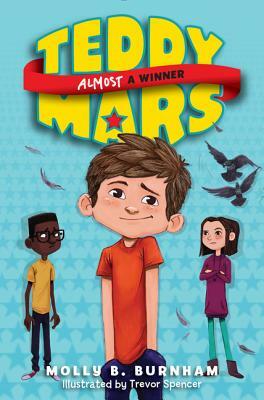 Teddy goes from record breaker to friendship fixer in the heartwarming and hilarious follow-up to Molly B. Burnham’s 2016 Sid Fleischman Humor Award-winning debut, Teddy Mars: Almost a World Record Breaker, now in paperback. Win or lose, friends stick together. But when Teddy’s whole class decides to break a bigger, better world record, friends turn into enemies. And Teddy feels stuck in the middle. To fix this mess, Teddy will have to do something he’s never done before—try NOT to break a record! Can he win at losing before his whole class misses out? Humor and grit triumph in this story of one boy’s struggle to make peace in a class full of record breakers, a coop full of pigeons, and a world full of wonders. Told in short, accessible sections with fun lists and highly rambunctious illustrations, the heartwarming Teddy Mars series is perfect for reading aloud. Teddy’s never-give-up attitude will have readers laughing out loud and striving to break world records of their own.